[New for 2012, didn't last long] With the arrival of the new 2012 Breyers Blasts flavors, I will admit I am a little apprehensive. 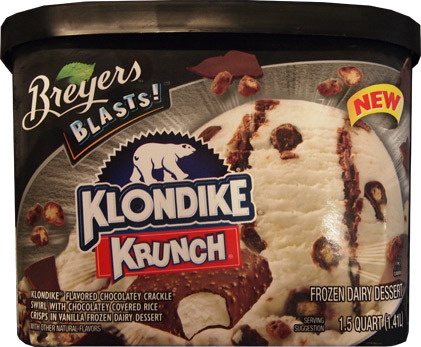 On one hand, Breyers really seems to be trying to branch out and create some provocative new flavors. On the other hand, I really miss the days when Breyers stuck to making awesome all natural ice cream --- actually, to recap, let me state that Breyers newly redesigned website is claiming Banana Split and S'mores are new for 2012 (even though we saw them last year). It also looks like Double Chocolate Milkshake and Tin Roof Sundae have bit the dust (neither of which I bothered to try, oh well!). Now this one is definitely new for 2012. 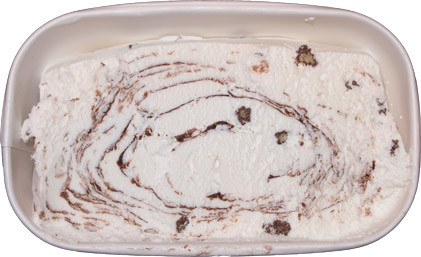 It's Klondike Krunch which is Klondike Flavored Chocolatey Crackle Swirl with Chocolatey Covered Rice Crisps in Vanilla Frozen Dairy Dessert (with other natural flavors). My word, I think I just got carpel tunnel typing that one. This one clocks in at 1.5 quarts and as you may have noticed from the picture, the new container seems to be taller and thinner. Ok, that's better. There's quite a bit of swirling going on here so this has promise..... oh who am I kidding, it's weak, barely flavored frozen dairy dessert. 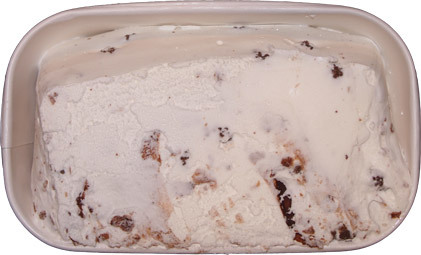 Breyer's old Chocolate Crackle had the Klondike flavor locked up pretty tight. This stuff reminds me of eating expired, on sale Klondikes that have been sitting in my hot car for an hour. Oh me, oh my, where are my manners. I forgot to show you the penny test. Whole crisp on the left, one cut down the middle on the right. 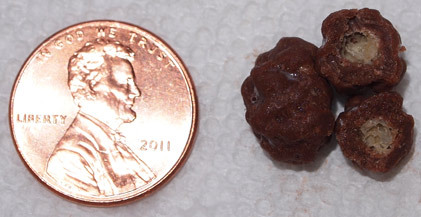 It could be a chocolate coated rice krispy and I wouldn't know the difference here. There's a decent amount of them floating about, but have I mentioned I'm bored? It's not like something that small adds any kind of real crunch, nor does the "crackle swirl" for that matter. Had I been crunching my brains out, I would being shouting about this one from the roof tops. Look, I don't mean to get offended easily, but it drives me bonkers when they take a cool flavor and totally mess it up by making it a frozen dairy dessert. Did Breyer's get bought by Edy's when I wasn't looking? This is the same punishment we've gone through a thousand times. The most offensive part is that it's not like the nutritional value has changed much, it's all about saving money.... grrrrr, if I had won that giant lottery I would have bought Breyers and heads would have rolled man, heads would have rolled. Hey, I'm sure some will like this, so let me sum it up another way. Me: "hey princess, do you like your ice cream?" Daughter: "ahhh, I've had better"
On Second Scoop: I finally got back to trying this one and I still don't like. Yes it has that Klondike taste, but in a cheap, worn out sort of way. I don't know, but something is different and I'm too much of a purist to enjoy these. Oh well. I did notice that it you wash all the chocolate off a krunch bit, it looks an awful lot like a rice krispy. Your daughter sounds adorable! I think I'll skip this one as well; doesn't look that great. Thanks for the heads up that Bryers has discontinued the Double Chocolate Milkshake. I sort of wanted to try it but didn't buy it the last time I was at Walmart. Have you seen the Bryer's Blast with the vanilla oreos? as a cookies n cream fanatic, golden oreo will probably be the next BLASTS flavor I try. She's my little foodie buddy and tries most of the stuff you see on the blog. You can tell the difference between when she loves something and when she's just eating something because she is hungry. Have you seen the Bryer's Blasts Peanut Butter and Jelly? I saw it today for the first time but don't like jelly so skipped it. I'm like u dubba on frozen dairy desserts, but I really liked the golden Oreo flavor. Baskin Robbins version was the best! Im not sure its about saving money either. I think it is more about the bad rap "ice cream" has got. We are an obese nation yada yada yada. So instead of being fat from ice cream lets call it a frozen dairy dessert. That doesn't sound so "fat"
ahhh, i don't really buy that. a chemical product means less costly cream and milk, more filler chemicals, and a longer shelf life. I don't buy the fat argument because many FDD flavors are just as unhealthy as the original. there are occasions when FDD are decent, but as a whole, I just don't like them. we are both entitled to our opinions but by choosing to be non-specific in your response, we can't really argue the finer points of this particular dessert now can we? I should have listen to your daughter. I bought the flavor & have had much better.